While the visibility of protests in the NFL this weekend was not what it was during Week 3, there were still some players who did kneel, sit, or hold up a fist throughout the playing to the national anthem. One of those players was Marshawn Lynch of the Oakland Raiders, although it would have been hard to tell at the game. Lynch sat during the anthem as he has routinely done in previous games, however, this time, Raiders personnel surrounded him tightly, obscuring him almost completely from view. It is not known why Lynch was covered from view, but it was not the only political message he made on the day. Before the game, Lynch wore a shirt that read "Everybody vs. Donald Trump" as he entered the stadium. 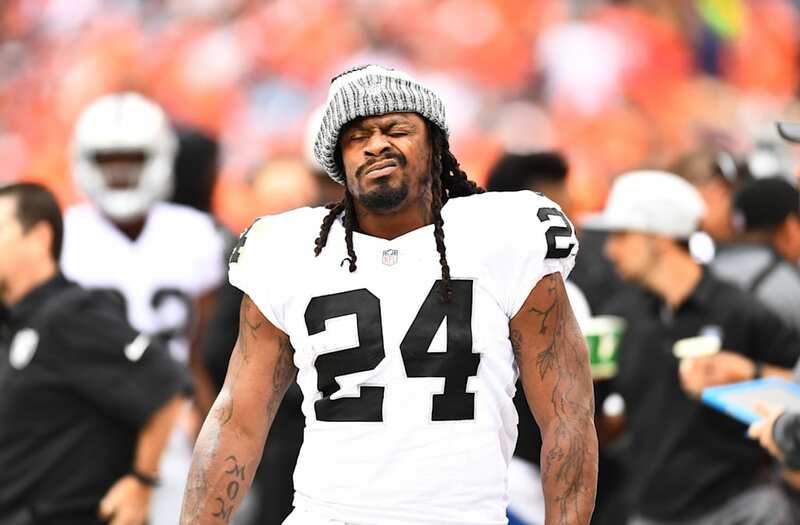 Throughout his career Lynch has spoken his mind and its likely the Raiders couldn't stop him from sitting during the anthem if they tried, but it will be interesting to see if his demonstrations during the anthem continue to be shielded from public view by the team.